That’s all, folks! 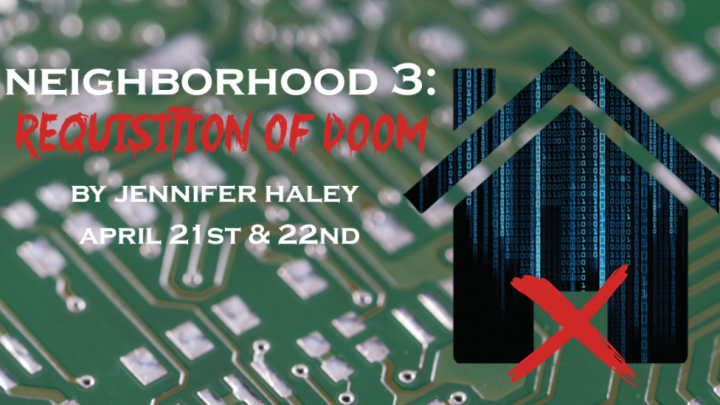 DART 4F56’s production of Jennifer Haley’s Neighborhood 3: Requisition of Doom has reached the last chapter. Leading up to our weekend of performances we had not one, but four tech runs—that is a lot considering Brock mainstages only have two. Since this was such a tech-heavy show it was crucial to be able to practice with tech as much as possible, especially for those scenes in which the game is being played (when actors were cued off the game noises and vice versa). By the time Thursday night rolled around we were all feeling the after-effects of those long hours. At the same time, we who were performing in the show knew that we couldn’t allow ourselves to get too comfortable—Gyllian and Olivia made it clear to us that there was still room for us to play and explore so that we could find something new in all our scenes. There was a stark contrast in energy, intention, and audience reaction between the preview, Friday’s opening night, and our Saturday matinee. Before Friday evening’s show, backstage was buzzing with excitement and anticipation—most of us had friends and family coming so the stakes were high. Down in the Green Room we have televisions that give us a view of the stage from behind the audience—while audiences were settling into their seats we were all gasping and cheering as more and more people entered the theatre. 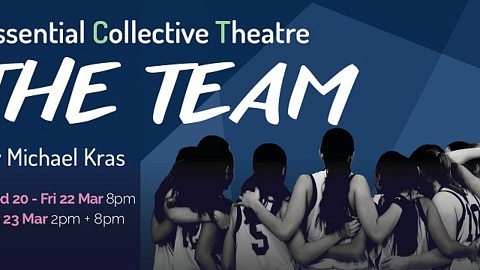 That night the show took a huge step—having so many people in the theatre rooting for us (including every single one of our performance professors) gave us the confidence to play on stage, and demonstrate how far we had come from the beginning of our university careers. The Saturday matinee was a different story: fatigue hit us all that morning. The energy in the Green Room declined significantly; the usual chatter and light-hearted fun while we prepare was absent as we clung to coffee cups to keep us vertical. This obviously translated onto the stage—as much as we take pride in our show and enjoyed performing it, a lot of us felt that having the Saturday matinee was overkill. For this show our house numbers were the lowest which had a disheartening effect as well. The closing show was our best performance by far. There was a mixture of excitement, sadness, giddiness, and relief in the Green Room that night: excitement as this was our biggest house yet, sadness as this was our last show together as a class, giddiness in the form of dressing room dance parties and cast pranks, and relief that this long (and often strenuous) journey was coming to an end. The weight of what that night’s performance meant to all of us hit, and some pre-show tears were shed. During the show some of us stood backstage to watch our fellow cast members invest everything they had in this last run, silently rooting for them. Up until this performance the curtain call had gone as planned: running out on stage for a group bow, bowing in pairs, then one last point to the booth and off stage. We wanted to go out with a bang so as a last show prank we decided to run back out on stage and dance (the audience didn’t seem impressed). 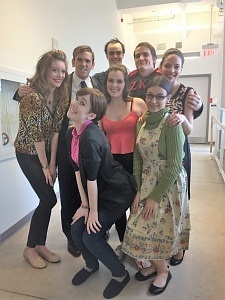 Not only was it our final curtain call of DART 4F56, for most of us it was the final curtain call for our years at Brock—next time we’re crossing a stage, we’ll be wearing caps and gowns! I’m glad that I was able to share this experience through these vlogs and blogs, as this process was an important part of our university career. It’s been a long, bumpy road: from starting later in the semester, scheduling setbacks, the high technical demands, dealing with around 20 costume quick changes, to overall doing eight full runs of the show in one week! Though things sometimes felt overwhelming, I couldn’t imagine a better group of people to have shared it with—each member of DART 4F56 brought something unique to the table that contributed to our work as an ensemble. In the end I put in a total of 205 hours to this project, but some of my peers (especially designers) put in as many as 250 hours. If there is one big picture idea that I took away from this whole experience it’s that forming an ensemble and fostering a safe space for creative work are crucial to the success of DART 4F56—our sense of company solidarity and identity, while it still had room for improvement, strengthened us and provided us with the support we needed. There is not a vlog this week as doing four shows did not permit me the time to film much, but here is a video that was created by actor and show choreographer Rachelle Scott as a tribute to our year in DART 4F56! This week’s written portion is going to be short and sweet—which is the antithesis of how the last two weeks have felt for the DART 4F56 team. Can you believe it? We go on in just under a week! Six run-throughs of the full show, loading into the theatre, and a whomping 10 hours of cue to cue (with more still to come this week) later, we are officially in the final days of this “collective creative chaos” (as Sean Rintoul called it in our very first post). This coming week we finish off cue to cue, do a rough tech/dress rehearsal, and then a final tech/dress before opening night this Friday April 21st. Stay tuned the week after the show for our final post—hear how the show went and what the experience was like for my fellow DART 4F56 crew! Now for this week’s vlog! It has been a heavy two weeks for the DART 4F56 ensemble—with load-in and tech week only days away, our schedule has been chock full of long rehearsals and many, many build hours. I’m turning the writing over today to assistant director Olivia DeSousa, who will talk about her work on the show. Over to you Olivia! As Sarah said, I’m Olivia De Sousa and I am the assistant director and assistant sound designer for Neighborhood 3: Requisition of Doom. 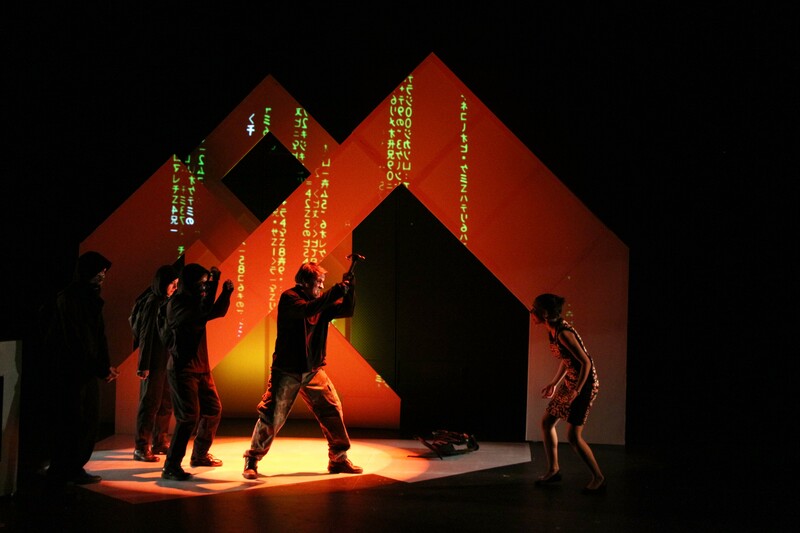 Directors oversee all creative aspects of the show; they are the communication centres through which the company members and departments liaise. We collaborate on everything from costumes to the set design. As assistant director I work side-by-side with our professor, Gyllian Raby. This is super-intimidating, but so rewarding—I took the directing course offered at Brock last year, also taught by Gyllian, and directed a one-act play as part of that course. Fun fact: I didn’t even apply for the directing role in 4F56 because I didn’t think I was good at it. When Gyllian asked me about this, it was the first time I had even considered it an option. Being able to work under my professor with all her years of experience has given me a new perspective on directing. There are many up and downs of this role, and the pressure is certainly there—but one thing I know for sure is I would never have gotten this experience elsewhere. Now about the play! 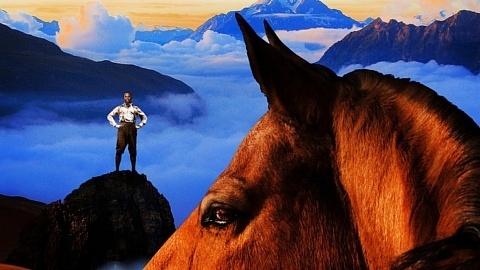 Some of the themes in the play are universal: the feeling of safety in a community, fear of the unknown, parent/child relationships of all shapes and forms. When we cast the show, we had to find a way to double up the characters because we only had eight actors and a plethora of characters. In approaching this challenge, I tried to have each actor play one adult and one kid. This illustrates the idea that every parent was once a kid and every kid will grow up to be an adult. It also highlights the mature qualities in the young characters and the immature qualities in the parents. Technology is also a huge area of interest in our rapidly-advancing world. We want the audience to leave the play with a critical mindset. We want to inspire discussions rather than lecture the audience about the quote-unquote dangers of technology. Within the play itself, we want to create scenes that are hyper-real (rooted in the present day, in believable situations). We want to contrast this with the walkthroughs which are stylized, choreographed, and technology-driven. The walkthroughs (our fancy word for scene transitions) are a visual representation of the journey each character takes in the neighborhood, with a digital twist. That’s all for me; thanks for reading and make sure you come out to the show! Our opening night is April 21st at 7:30pm, then we have two more shows on April 22nd at 2pm and 7:30pm. Now for this weeks vlog! These last two weeks of DART 4F56/4P97 have been a whirlwind—as you saw from last week’s vlog, we kicked off our first two weeks with research presentations, ensemble work, scene transitions, and our first rehearsals. The weeks of March 6th and March 13th have been a continuation of these, with the addition of our set construction crew starting build calls, our social media team releasing company bios and contacting high schools, and some minor setbacks. This week, I and one of my scene partners, Demetri Tsioros, had our first rehearsals for our scene (fun fact: all the scenes in Neighborhood 3 are two-handers, meaning two actors perform). Something I took away from rehearsals this week was that physicality and mannerisms are a big part of character development in this show—as we are working with the concept of video game avatars, choreographer Rachelle Scott and fight choreographer Demetri have been working with us on base positions and range of locomotion in varying situations. The week of March 13th has been a doozy. The snow day on March 14th pushed us back in not just rehearsals, but set building and wardrobe fittings as well. In total we lost approximately 6 hours of build time, two hours of costume pulling and one hour of fittings, and approximately 8 hours of rehearsal. March 15th was a short day—we had our company check-in minus a few crew and actors as they were making up for our lost hours. At the end of the day, wardrobe managed to get all preliminary fittings done for the actors (celebrate the small wins!) and rehearsals ran smoothly despite only having from 4pm to 5:45pm. Now for our weekly vlog! It’s time for another behind-the-scenes adventure at DARTcritics! And one that, for me, is very close to home. On Tuesday February 14th, Brock University’s DART 4F56/4P97 class kicked off our second semester with a series of research presentations informing our approach to this year’s show, Neighborhood 3: Requisition of Doom by Jennifer Haley. In this play, set in a suburban subdivision with identical houses, parents find their teenagers addicted to an online video game. The game setting? A neighborhood completely identical to their own. The goal of the game? Slay hoards of zombies to escape the neighborhood, and get to the final house. As the line between the virtual and the real world becomes blurred, fear sets in and becomes a permanent resident in this suburb. DART 4F56 and DART 4P97 are fourth-year courses that go hand in hand, and together create an experience in Advanced Theatre Studies. 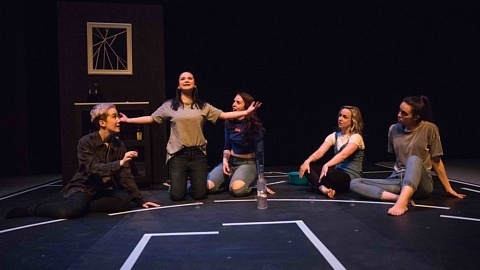 Whether producing existing scripts or creating new works, students operate as a collaborative theatre ensemble over a full academic year. Each student takes on a primary and secondary role in each semester, so that one could be head of wardrobe (primary) and a dresser (secondary) in the first first semester, and an actor and build crew in the second. This gives each of us a chance to either develop and enhance skills we’ve already been working on, or to learn something new. For the rest of this semester I will bring you an insider look into these courses and the processes that go unseen leading up to our final performance. As a third-year student, I remember the halls of the Marilyn I. Walker School of Fine and Performing Arts being abuzz with talk of “456”, some good, and some not-so-good—while the excitement of the up and coming shows was mounting, I couldn’t help but overhear talk of stress, burn-out, and the incredible amount work and time that went into these shows. The video you will watch (I hope!) below, is a glimpse into the first two weeks of class. 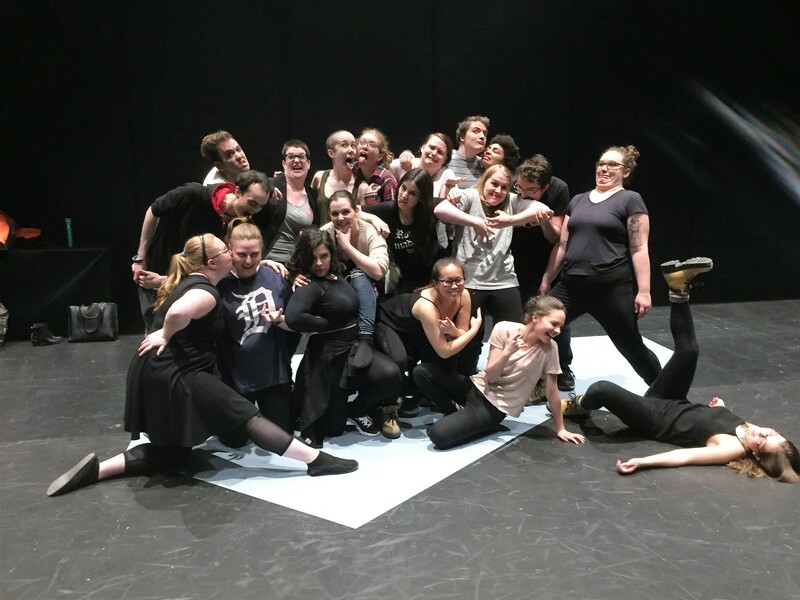 Gyllian Raby, our professor and director, has always emphasized that we must remain an ensemble and be in constant communication not only about matters of the show, but about how we are doing personally. This video includes rehearsal/class footage, as well as snippets of an interview I held with DART alumni Hayley Malouin, Sean Rintoul, and Mark Harrigan—you may recognize Hayley and Sean from their performances in Twitches and Itches’ production of The Bacchae, and Mark from his work last summer in Essential Collective Theatre’s Senior Stories. I asked each person about their own experiences in these courses, about stress and burning out, and what advice they would give to students who are interested in taking the course in coming years. NewerSeeing double: Vaudeville-themed Comedy of Errors is full of slapstick fun – but what about the women?